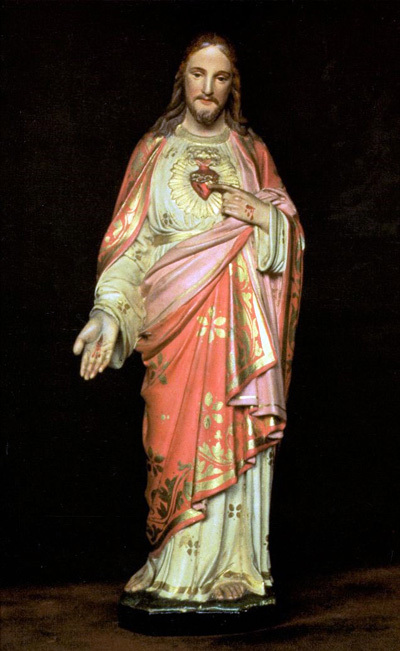 What does this statue of the Sacred Heart of Jesus at right make evident to our eyes? When the person is touched by a grace, it firmly emits the certainty that Our Lord Jesus Christ is God. Our Lord is well-presented, very erect; His bust and bearing are quite virile and serious, proper to one who considers everything with seriousness in order to see the reality of everything. He is the very image of certainty. The whole reveals the amplitude of the grand visions of the universe and of all that exists. His hair is parted in the middle, seeming to mark a universal symmetry in the world where everything can be seen in two similar but distinct aspects, which constitutes a superior harmony. His hair falls over His head and shoulders suavely, smoothly, in a perfect, flawless, uniform order. So welcoming and so affable, there is not a thread out of place. The gaze directed at the observer is filled with convictions and reflections, which have accumulated in a prodigious deposit of certainties, and that communicate to others what He is thinking. All this takes place on such a high, extraordinary plane that He manifests himself at the same time as true King and true Master. He is King par excellence. Not because He is in the habit of commanding or because others recognize in Him the right to command, but He is King in His very essence. He is King in His essence, regardless of what others think or do not think, or want or do not want.